The tech industry has always evolved at a frenzied pace. At the least, the growth has always been exponential. The best examples are smartphones and tablets. It is now common for even a six month old smartphone and tablet to be termed obsolete as more powerful and faster devices take its place. But the current rate of growth will be nothing compared to a growth that could be possible if a key restricting factor is taken care for good. As you might have already guessed, we are talking about batteries. Those stubborn pieces of polycarbonate shells that refuse to grow smaller and have hardly developed over the years when compared to the electronics. Unfortunately, we cannot do without a power source such as the lithium ion battery, which are found in literally every mobile electronic device that are in existence. Then the only solution is to develop radical new ways to make build smaller and more powerful batteries. Now, thanks to LG Chem, a sister company of LG Electronics has developed a new kind of lithium ion battery in the form of cables. And like any other cable, these battery cables can be bent, twisted, tied into knots, rolled and still be used to power devices like any other conventional lithium ion battery. The basic underlying principle is the same. There is an cnode, a lithium cobalt oxide (LCO) cathode and an electrolyte medium to facilitate the movement of electrons. The only difference is, instead of laying out the components in layers, they have been twisted and wound around each other inside a cylindrical flexible tube. 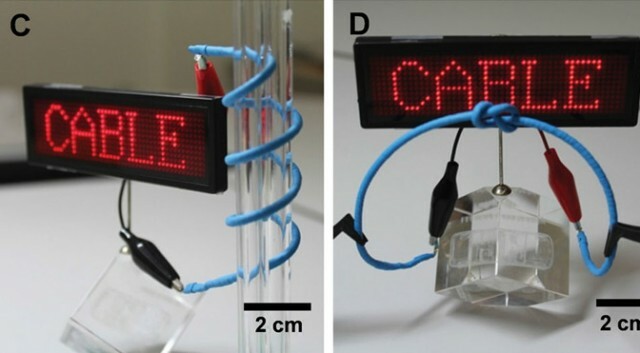 Extremetech explains how these flexible batteries function. For those who are still pessimistic about the success of cable batteries, LG Chem says these batteries have the same energy density as conventional lithium ion batteries and they have even managed to run an iPod shuffle for 10 hours straight using these batteries. LG Chem hopes to mass produce these by 2017. When it does come out, the possibilities will be endless.